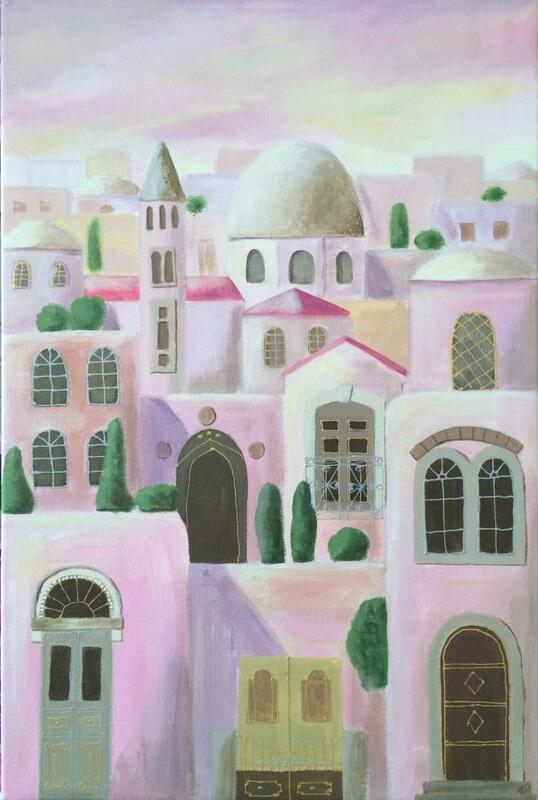 An architect by training, Dalia’s fascination with the buildings of Jerusalem is evident in this mixed media picture of the city. She picks out the features typical of Middle Eastern construction: the metal ironwork on the windows and doors, the domed roofs. The work of Jordanian-Palestinian artist Dalia Ali is based on mixed media techniques and acrylic paints. Dalia’s special skill is in working with different surfaces such as newspapers or patterned paper to create a unique effect, layering the paint with a knife to allow the underlying colours to come through and create texture. Dalia succeeds in sacrificing detail to create a more abstract effect without losing detail or content. © 2018 Levantine Gallery - All rights reserved to Levantine Gallery artists.